The Graduate Business Department at WIT School of Business is dedicated to the continuing development of learning at post-graduate level. In collaboration with industry, we have developed relevant, leading-edge programmes that provide our students with the knowledge, confidence and skills to succeed in business and in life. As a student with us, you benefit from our professionally oriented programmes and learn from fellow students who have extensive international and career experience. To learn about our Postgraduate Business Programmes, join us for our Open Evening from 5.00-7.00pm in our Executive Post Graduate Room D01, Waterford Institute of Technology, Cork Road Campus, Waterford on Tuesday 12th March 2019. Prospective students will have the opportunity to learn more about our range of full and part-time programmes and will also meet with staff who can answer questions regarding the curriculum, student life, and networking opportunities available at WIT School of Business. Our consistent approach has been to focus on producing exceptional graduates who have made an impact in organisations like Goldman Sachs, State Street Bank, PWC, Procter and Gamble, Microsoft and Google , as well as across thousands of organisations across the south east and beyond. 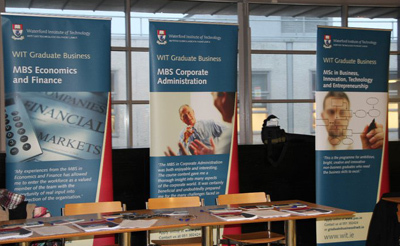 Supported by an exceptional careers service, WIT Graduate Business students are in demand. “Truly the learning has been hugely beneficial on many fronts and benefiting not only Chamber but all the stakeholder organisations’ understanding of the opportunity that place branding presents to Waterford”. At Waterford our focus is on producing graduates who make an impact. Over and above the in-depth knowledge that you get in most graduate business schools, at WIT we focus on the whole student, building personal and professional effectiveness through a challenging curriculum, delivered by exceptional faculty who provide an amazing learning experience. Our Institute and region offer many attractions both as an academic institution and a geographically and culturally attractive location in which to live. Many of the things that attract you to study in Ireland, the South East and Waterford have been the same things that have attracted our academics. Very simply Waterford and its region offer an outstanding quality of life. The great outdoors, sport, the arts, vibrant urban centres of Kilkenny and Waterford City, relaxed pace of life, reasonably priced property and world class enterprise, WIT has it all on its doorstep. Students are advised to consult this information on questions concerning eligibility to particular postgraduate business courses. The section below also provides information on the application process for postgraduate programmes within the School of Business. Applications are made online to the Postgraduate Application Centre (PAC). If you are having difficulty making the application, you can contact the School of Business via email ([email protected]) and we will endeavour to help you with the application process. Applications open in December for the following September entry. You are welcome to apply once applications open. Early applicants may be made provisional offers (provisional on achieving a 2H1 degree). The closing date for applications is 14th June. However, we would be pleased to consider application related queries at any time throughout the year. We only accept applications through the online PAC system (www.pac.ie). These are sent automatically to the Department of Graduate Business. You will receive a confirmation of your application to the email address specified in your online application. Can I speak to someone about the application process? Please contact the relevant Programme Director listed for the programme on the School of Business website. Alternatively contact Ms Margo O'Dowd at the Department of Graduate Business, email: [email protected] or telephone 051-302036. Will there be an interview as part of the application process? Participation on the programme is partly dependent on a satisfactory performance at the admission interview. What are the fees for my programme of postgraduate study? If you applied early (before end of May) and received a provisional offer (provisional on achieving a 2H1 degree), then it is your responsibility to inform us of your degree results once they become available. If you achieved a 2H1 then the provisional offer will become a firm offer. You will then have approximately 2 weeks to accept the firm offer by paying a €500 non-refundable deposit. Note: this deposit does not apply to International students. If you applied before mid June first round offers will be made in early July. You will then have approximately 3 weeks to accept the firm offer by paying a €500 non-refundable deposit. Note this does not apply for International students. If you applied early (before end of May) and received a provisional offer you will then have approximately 2 weeks to accept the firm offer by paying a €500 non-refundable deposit. Note: this deposit does not apply to International students. Late applications will only be considered subject to available places being available. A final round of offers will be made in late August. You will then have approximately 1 week to accept the firm offer by paying a €500 non-refundable deposit. However, leaving your application until July – August is not recommended as it is most likely we will be unable to offer you a place on the programme. 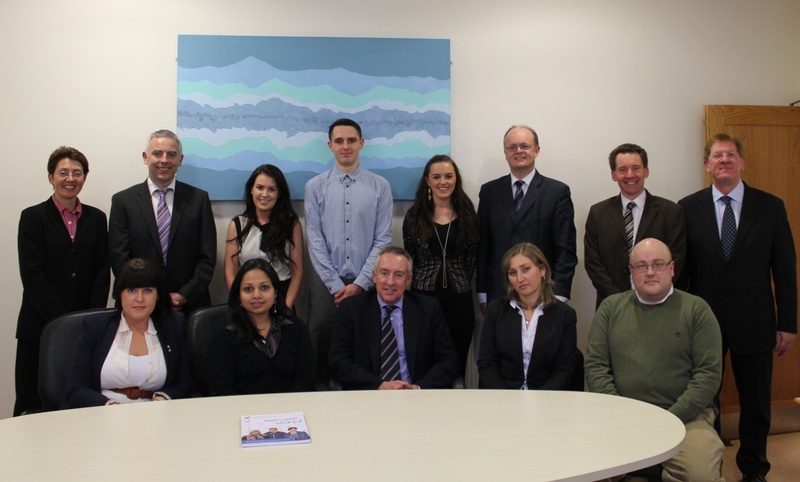 The Graduate Business Department at Waterford Institute of Technology has provided Irish and international students with the knowledge and the skills to innovate, change and excel in the business environment. Designed for the thinking professional, we have a variety of cutting edge programmes specifically focused across a broad range of disciplines to maximise potential within any industry. In an effort to assist high performing students to undertake postgraduate study at the School of Business, the School has initiated a range of new postgraduate scholarships. These scholarships are awarded to top performing students across the range of business programmes at postgraduate level. Applicants for the scholarships should be intent on studying a full-time postgraduate programme and have been in receipt of a grant in their final year of undergraduate study. Those students who have already commenced a Masters programme or those who have previously undertaken a postgraduate programme will not be eligible to apply for the scholarship. The scholarships are awarded on academic merit. Scholarships will be awarded up to the available number, to the best performing students who meet the eligibility criteria as evaluated by a School Selection Panel comprising the Head of School, Head of Graduate Business and the appropriate Programme Leader. Evaluations will be made based on student results in final year examinations. The closing date for Scholarship Scheme Applications is June 30th. Late applications will not be considered. 1: Apply through PAC (www.pac.ie) for their programme of choice and satisfy the appropriate entry requirements. Applications should be made by June 30th. For students graduating this academic year, all relevant documentation should be uploaded to the PAC system by no later than July 1st. 2: Apply for the scholarship scheme by submitting a CV and one page statement in support of your application. This should be sent to [email protected] clearly marked ‘Graduate Business Scholarship Scheme’. Successful applicants will be required to show evidence that they have previously been in receipt of a grant and that they have applied for the Student Grant Scheme for the forthcoming year. The scholarships are awarded on the basis of financial need and academic merit. Scholarships will be awarded up to the available number, to the best performing students who meet the eligibility criteria as evaluated by a School Selection Panel comprising the Head of School, Head of Graduate Business and the appropriate Programme Leader. Evaluations will be made based on student results in final year examinations. The scholarship amount for each student is €1,500. The student will be required to undertake postgraduate study in the School of Business, WIT. The scholarship awards will be announced on July 31st and successful candidates will be notified by the school office. If a successful candidate does not accept the Scholarship, the award may be made to the next ranked candidate. Please note that the award may not be deferred and those who accept an award and fail to complete their studies will not be eligible to apply again. The Scholarship will be paid in two instalments.